The major indexes finished lower after a volatile session, but negative sentiment regarding subprime mortgages kept buyers at bay with broker Bear Stearns (NYSE:BSC) $139.10 -3.23% closing at a 9-month low on heavy volume of 10.5 million shares. Last week, Bear Stearns said that two of its hedge funds, Bear Stearns High-Grade Structured Credit Fund and The Bear Stearns High Grade Structured Credit Enhanced Leveraged Fund, nearly collapsed after betting on complex securities backed by subprime mortgages. Late Friday, the broker said it would bail out one of its hedge funds with $3.2 billion in secured loans that were backed by assets the firm sees as "beaten down dramatically," with the collateral worth more than the amount of the loan. Bear Stearns said the two hedge funds had assets of more than $10 billion as of a week ago, and that the firm's commitment was less than $35 million. The firm's CFO, Sam Malinaro said the company's mortgage business, recognized by Wall Street as one of the most experienced, would not be affected by the funds' performance. However, Mr. Malinaro did say that while mortgage-backed bonds in the subprime arena looks to be contained, the two funds' high-profile struggles seem to be increasing risk premiums (read decline on prices, higher yields), or increasing the additional cost of borrowing money for risky investments. But Bear's move didn't seem to calm Wall Street's jitters. While the major indexes did reverse opening session losses after the National Association of Realtors said that existing home sales declined in May by only 0.3% to an annual rate of 5.99 million units, versus consensus of 5.96 million, a mid-session downgrade by Standard and Poor's on a large number of bonds backed by risky home loans made in 2005 and 2006 zapped buyer's enthusiasm. Tomorrow's release of existing home sales (consensus 922K) after last month's much stronger-than-expected 981K is going to be closely monitored by all market participants. I would have to surmise that the weakness in the DJUSHB over the last month has market participants viewing last month's report as not being the "v-bottom" in housing. The S&P 500 Index (SPX.X) 1,497.74 -0.32% looked as if it was set to make a move above an important level of weekly resistance at its WEEKLY Pivot of 1,513.54 (derived from last week's H/L and Close) and MONTHLY Pivot of 1,514.32 (derived from May's H/L and Close) as S&P's word of caution was delivered. If looking for an end of month rally, which could have mutual funds and hedge funds putting "sideline cash" to work, check out today's SPX highs, note the overlap of SPX WEEKLY and MONTHLY Pivot, and that is likely the near-term line in the sand for technical strength. If institutional computers are set to sell, the SPX should NOT get much above today's highs, or the correlative WEEKLY/MONTHLY Pivots. The homebuilders as depicted by the Dow Jones Home Construction Index ($DJUSHB) 556.23 -1.85% certainly don't like the recent revelations out of Bear Stearns and closed at their lowest level since 07/18/06 (557.76), so a new 52-week close here tonight. Since last Monday, the DJUSHB is down 5.37%. This despite the benchmark 10-year Treasury Yield ($TNX.X) falling 6.0 basis points to 5.078% today. Since last Monday, the 10-year Treasury YIELD ($TNX.X) is down 6.4 basis points. Since writing my 6/11/07 wrap "Banks Key as Yields Move Higher," the 10-year Treasury YIELD ($TNX.X) is down 5.9 basis points. Now you know me. I tend to review my commentary, notes that I take, and I hope you're doing the same! Since that very same wrap from 6/11/07, the S&P Banks Index (BIX.X) is down 2.3%, having declined 3.36% since last Monday, June 18th and have closed just below the 390 level of support I felt was important. While the BIX.X did trade strong into early last week near 405, sellers certainly seemed to outnumber buyers at that important level of resistance. In my 6/11/07 I reviewed how regional banks can benefit fundamentally, or be hurt fundamentally by Treasury YIELD movement, where "loan demand" becomes the more difficult variable to observe. You see, we can view, observe or see which way YIELDS are moving, and can view, observe, or see how the MARKET is treating the banks. Get 50% of your trades wrong and still make big profits in the stock market! We'll show you exactly when to buy and sell stocks with a proven method used by professional traders to manage risk, nail short-term gains, and pile up amazing profits. Master short-term trading with our expert analysis, detailed technical charts, and precise trade setups including specific entry, stop, and target prices. Now Completely FREE for 30 Days! Bear Stearns' recent news creates the uncertainty, and has evidently increased the "risk premium" of mortgage loans. Both "old," or previously originated, and "new" loans that lenders contemplate making. Oh, they'll still make new loans, but they'll likely be adding in points, or higher lending rates. I currently observe WEAKNESS in the BIX.X. And here's where I want to "build" a little on the 05/11/07 wrap, and discussion of Treasury YIELDS, as it would relate to the MARKET's perception of inflation, or lack of it, and this Thursday's upcoming FOMC decision on interest rates. There may be some equity traders that are wondering "why" we seem to have lost the "lower yield = higher equity prices" in recent sessions. Here's my analysis, based on recent observation, and some years of observations. In Friday's OptionInvestor.com Market Monitor I "alerted" traders that the December Fed Funds futures (ff07z) 94.83 +0.02% began hinting that the likelihood of a Fed RATE CUT had just started to increase, with a 10% probability of a 25 basis point cut before the end of the year. At tonight's close, the "odds" increase to just over 30% on the longer-dated December contract. Trying to "read" the bond market isn't as easy as some might think. There are different variables, observations that I like to follow over time. But to start, you have to know where you've been in order to hopefully know where you're headed, and "why you're headed that direction." The reason I do comment on Fed Fund futures at this point in time is that compared to Treasury Bond's trading in recent weeks (remember the sharp move higher in Treasury YIELDS) that may have had some, including PIMCO'S Bill Gross making a very bearish call on Treasury bonds, it might appear that the Fed Funds futures "have it right!" That is, even in early June, when the benchmark 10-year YIELD ($TNX.X) was trading with a 4.95% yield, and had yet to "jump" to as high as 5.316% by June 13th, the above December Fed Funds futures contract was hovering at 94.77, or just above 94.75, which would be viewed as a Fed Funds target of 5.25%. On my various Fed Funds futures charts, like that shown above, I like to place a retracement bracket on the contract(s), but use a "10%" increments. You and I know that the Fed moves in increments of 25 basis points, so each "end" of the retracement bracket can be placed at each 25bp increment. That is, a Fed Funds Target of 5.00% would be equivalent to Fed Funds futures 95.00. A Fed Funds Target of 5.25%, which is the CURRENT target set by the FOMC would be 94.75 Fed Funds futures. My analysis here is that "Fed Funds have it right/correct" and that the recent Treasury bond market action has indeed had bond traders making the adjustment, and should now be more "in tune" with Fed policy. If anything, the Fed Fund futures now begin to suggest at a MINIMUM that the FOMC will take NO ACTION on Monday. Now, I want to STRESS, that I am interpreting what the MARKET is saying. It is IMPORTANT to understand this. I would also say that the MARKET is now thinking that the FOMC's brief commentary in Thursday's statement will likely be less hawkish in regards to inflation. Now, on Thursday, if ANY OF THIS MARKET ANALYSIS is WRONG, be ready for a NEGATIVE reaction, or LOWER equity prices. Why does the Fed RAISE rates? Yes! To cool economic expansion and apply pressure, or try and ease inflation! Housing prices look to be trending lower, not "plunging" at this point, but this was an inflation fear of the fed several months ago. ENERGY prices were another major concern. Why does the Fed LOWER rates? Yes! To stimulate economic expansion as long as inflation remains under control. For those monitoring higher GRAIN prices, and wondering what the Fed can do about that, I've yet to come up with a good answer. I'm not familiar what type of Fed policy, other than raising margin requirement on futures accounts to remove some speculator from the market, that could bring grain prices down. If my analysis of the MARKET (or MARKET PARTICIPANTS) is CORRECT, then SPX 1,515 should be BROKEN TO THE UPSIDE! Where've we been? How about from about 4.675% at the 5/11/07 close to above 5.245%. Now a "doji" weekly bar/candle close on Friday, and a sliiiight undercut of last week's low as December Fed Fund futures tick "up," and begin to hint at NO fed action Thursday, with a slight bias toward LOOSENDING. I say a 5 handle, or 5.00% at Friday's close with the December Fed Funds futures (ff07z) going out at 94.875. Where've we been, where are we headed? Well, with the BIX.X right at 390 and 50% of its 06/23/06 to 02/20/07 range, I'm going to have to mandate that the BIX.X gets some bullish traction now. If not, we're going lower on the SPY. Here too we've got overlapping WEEKLY Pivot ($151.33) and MONTHLY Pivot ($151.63) less last week's ex-dividend of $0.6556/share. Even as the 10-year Treasury Yield ($TNX.X) edged lower last week, the SPY did see a Friday close below its 5/11/07 "doji" weekly interval bar. I tend to use MACD as an indication of bull caution, and if over leveraged on the long/bullish side, late February's sharp weekly decline on the break below its 10-week (50-day SMA) provides the caution. December Fed Fund futures (ff07z), if not the other nearer-term Fed Fund futures contracts all suggest NO FOMC action at Thursday's meeting. Yes, the higher 10-year Yield ($TNX.X) may have weighed on the SPX/SPY, or broader market, but now it eases a bit, and begins to mirror Fed Funds. With equities flat-to-lower last week, I would even suggest the LOWER yields (bond buying) a bit defensive. And the CBOE Volatility Index (VIX.X) 16.65 +5.71% challenging its June 7th relative highs of 17.09 again today, that hints market participants are jittery about something. And it shouldn't be the Fed. We do not see any changes from our weekend comments for APH. We remain cautious with APH. The longer-term trend is still bullish and Thursday's rebound looks like a new entry point for bullish positions. However, with the market sinking sharply on Friday, we would prefer to see more strength before initiating new positions. Our target is the $39.75-40.00 range. It looks like the rally in CALM is running into trouble. The stock produced a bearish failed rally under the $16.00 level today. The $15.00 level has been holding as short-term support but we wouldn't expect it to last if the market indices really turned lower. We'll try and reduce our risk by raising the stop loss to $13.90. Our target is the $17.40-17.50 range but more conservative traders may want to exit near $16.50. The picture is growing more negative for CBG. The stock plunged toward its 50-dma this afternoon. If we don't see some sort of bounce tomorrow we'll drop it as a bullish candidate. Currently we're suggesting a trigger at $40.15 to go long the stock. Our target is the $44.00-45.00 range. The P&F chart points to a $52 target. The Chinese markets traded sharply lower today (-1.7%) yet CN managed to post a 0.5% gain. We are encouraged by the relative strength in CN but we wouldn't put a lot of faith in it. More conservative traders may want to tighten their stops even higher. We're not suggesting new positions. The P&F chart points to a $73 target. We're aiming for the $59.50-60.00 range. More aggressive traders could aim for the highs near $62.50. We do not see any changes from our weekend update on COLM. The trading in COLM over the last three days is starting to look bearish. The larger trend is still positive so we'll wait and watch for a bounce. At the moment we're expecting a pull back toward the $66.00 level and its 50-dma. A rebound above $66 could be used as a new entry point. Our target is the $73.50-75.00 range. The P&F chart is very bullish with an $89 target. We are not suggesting new positions in EMC. Readers might want to bail out now and try to lock in a gain. If not consider raising your stop loss toward $17.00 or maybe even $17.45. The $17.50 level has been holding as short-term support the last few days. Our target is the $18.50-20.00 range. There is no change from our weekend update on GPI. More conservative traders might want to tighten their stops. Another bounce near $41 could be used as an entry point while conservative traders may want to wait for a new relative high over $43.00 or $43.50. Our target is the $47.00-48.00 range just under the descending 200-dma. FYI: The P&F chart is still bearish. JASO displayed relative strength. The stock hit an intraday high of $31.84 but eventually pared its gains to close with a 2.1% rise. More conservative traders could tighten their stop toward $28.00. Our target is the $33.00-33.50 range. The Point & Figure chart is very bullish with a quadruple-top breakout buy signal and a $47 target. More aggressive traders may want to aim higher. The bounce in SM today almost looks like a new bullish entry point. Look for a move over $38.30 or $38.50 as a chance to buy the stock again. Our target is the $43.50-44.00 range. The P&F chart is bullish with a $51 target. Thank goodness for triggers. There was no follow through on Friday's story-induced rally. Shares of VSE gapped down and plunged throughout the session to close with a 5.2% loss. More aggressive traders might want consider trying to buy a bounce near $13.00. We'll wait for our trigger at $14.55. More conservative traders may even want to wait for a rise past $15.00 before buying the stock. We are going to use a wide (aggressive) stop loss under the recent low. Our target is the $17.75-18.00 range, just under the simple 200-dma. We'll be watching the 50-dma and 100-dma as potential resistance. FYI: The P&F chart is still bearish. Caution! Even though WIRE displayed relative strength with a 0.8% gain the stock also produced another bearish failed rally pattern. Odds look good for a dip back toward $30.00 soon. We're not suggesting new positions tomorrow. We are targeting the $32.50-33.00 range. Aggressive traders could aim higher. AMB is still sinking. Shares lost 2% on rising volume and they're quickly nearing our target in the $52.00-50.00 range. We're not suggesting new positions at this time. Breakdown alert! 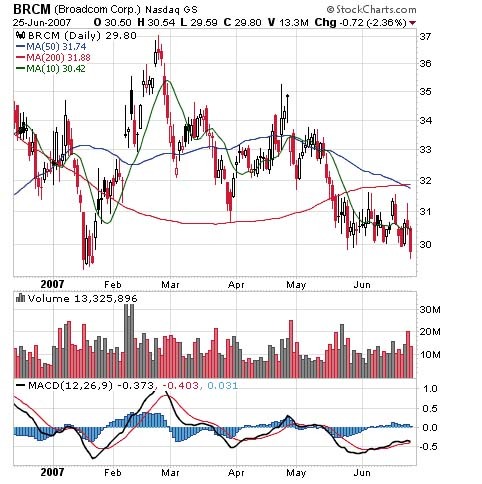 BRCM broke through support near $30.00 and closed at a new relative low. We were suggesting a trigger to short the stock at $29.75 so the play is now open. Our target is the $27.00-26.00 range. We do not want to hold over the mid July earnings report. FYI: One of the larger risks with shorting BRCM will be any sort of headline-making news events in the legal battle between BRCM and QCOM. Trading in CAL looks pretty bearish today. The stock lost 2%, produced another failed rally and what appears to be a bearish engulfing candlestick. However, before you consider backing up the truck to short this stock, consider two things. First, crude oil was slipping today. If oil continues to slide it will pull airlines higher. Second, the selling in CAL stopped almost exactly near the bottom of its June 19th gap. The trend is bearish but you might want to use a tighter stop loss. Our target is the $30.50-30.00 range. We do not want to hold over the mid July earnings report. HCN lost 1.3% and closed at a new relative low. The stock is nearing our target in the $38.50-38.00 range. We're not suggesting new positions at this time. SPLS is still sinking on big volume, which is usually bearish. Unfortunately, shares rebounded from their intraday low at $23.70. The trend remains bearish but this is usually where SPLS tries to produce an oversold bounce. Our target is the $22.00 mark. There is no change from our previous comments on UST. The trend is still bearish although we're not suggesting new positions. UST has already hit our target in the $52.60-52.50 range. Now we're aiming for the $50.50-50.00 zone. Target achieved. 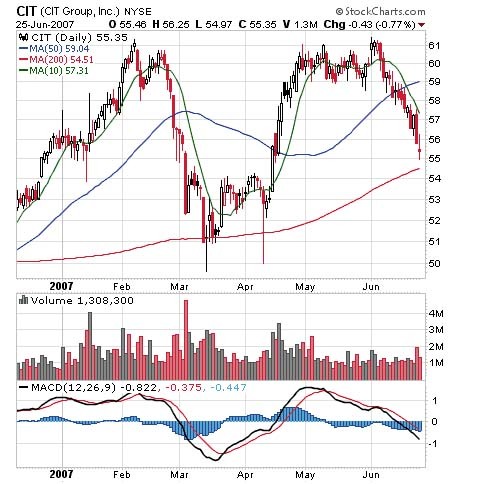 CIT dipped to an intraday low of $54.97. Our target was the $55.25-55.00 range. If you did not exit be careful. CIT appears to have support near $54.00 and its 200-dma near $54.70. Target achieved. 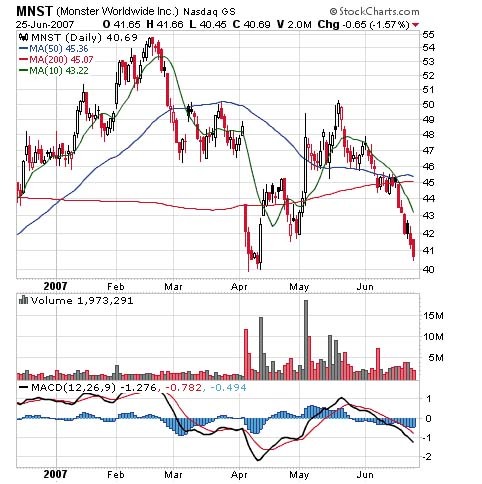 MNST continued to sink, posting its sixth decline in a row. The intraday low was $40.45. Our target was the $40.50-40.00 range. Today's Newsletter Notes: Market Wrap by Jeff Bailey and all other plays and content by the Option Investor staff.